Stratford Town Trust are trustees of charitable land at the back of Avenue Road (accessed via public footpath at top of Welcombe Road), and through and round to Maidenhead Road which is known as Rowley Fields. It is used regularly by Stratford residents for recreational purposes – the use to which it was intended when it was left to the Trust’s predecessors. In January 2013, the Trust spent over £615,000 of charitable funds to buy 7 Benson Road, over and above the asking price, to gain access to part of Rowley Fields at the rear of Avenue Road – both have been sold subject to contract for development. There is as yet no planning application or approval on this land called the Benson Road parcel so it is not too late to save it. 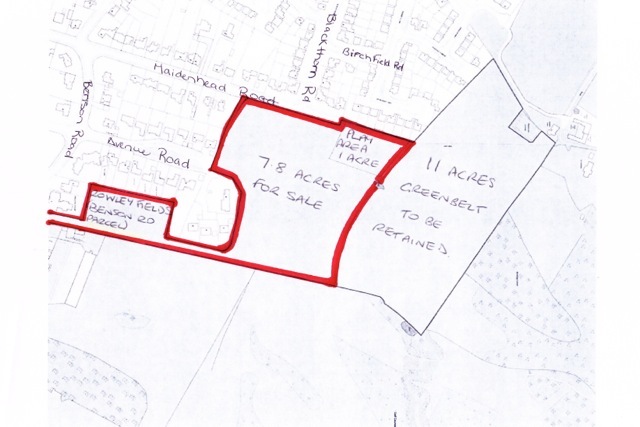 Towards the end of 2014, the Trust put forward a further 7.8 acres of Rowley Fields at the top of Maidenhead Road for development of 80 houses. This is despite the Trust saying only some months ago that ” the Trust is not selling Rowley Fields.” The map of the smaller Benson Road parcel and the larger parcel is shown below. Building on any part of Rowley Fields will mark the beginning of encroachment on an important natural and beautiful local area. Development of this kind is not in accordance with the District Council’s current proposals for development in Stratford upon Avon, and we believe it is reasonable to expect that a responsible body like the Town Trust would have regard to these. After all some of the town trustees are in fact councillors of the District Council. If you live in Stratford, you are a beneficiary of the Trust and according to the Charity Commission, you should expect the Trust to be open and consult with you about purchases and sales of land and property like this. The Trust totally disregarded this guidance in relation to the smaller Benson Road parcel. It has announced a consultation for the larger 7.8 acre parcel. If you are concerned about the Trust spending funds in this way, failing to be open and consultative, and planning to allow some or all of this beautiful area of green space to be developed, then please show your support and help to stop this development before a planning application is submitted. Go to the consultation meetings being called. Become a member of the Trust so that you can air your voice direct. Please also object to the Chair, Chief Executive or any of the Trustees of Stratford Town Trust, your local councillor from the Town Council or Stratford upon Avon District Council, and the Charity Commission. And if you are a paid up member of the Trust then let us know as we only need 10 per cent of the total members to force the Trust to hold an extraordinary general meeting where they will have to discuss this issue. Go to our Get Involved page for how to register your support. WHAT IS THE CHARITY COMMISSION AND WHAT DOES IT SAY? The Charity Commission is the regulator for charities such as Stratford Town Trust in England and Wales. It issues guidance on what charities should do and handles complaints from the public about charities. See http://www.charitycommission.gov.uk/detailed-guidance/cc-guidance-numerical-index/ for the guidance that it issues. There are things that the Trust must do and should do. The Charity Commission defines should as minimum good practice guidance the Trust should follow unless there is a good reason not to do so. Publications CC28 and CC33 deal with purchases and sales such as 7 Benson Road and Rowley Fields. The following extracts are things the Trust should do. Para 27 Some charity projects involving the acquisition of land arouse opposition locally, even to the extent of active hostility. Where this is likely, trustees are advised to plan carefully in advance, to consult widely and to provide full information about their proposals and the reasons for them. Para 2.1 You will want to be satisfied that any disposal will be in the charity’s best interests. —Or in spite of the money that could be realised, you might consider continuing to use it for the benefit of the charity. Para 2.2 In some cases only the specific piece of land in question can be used and it cannot be replaced. Examples of this are: —- a particular area of land of outstanding natural beauty. Para 2.4 Although it shouldn’t necessarily be an overriding consideration, you should think about who else would be affected by the disposal – for example, would it affect the beneficiaries, or public support for the charity? —– Even where it is not a legal obligation, it is still good practice. HAS THE TRUST COMPLIED WITH THE ABOVE?